This was my baby girl a year ago, all pudgy cheeks and sleek black baby hair. 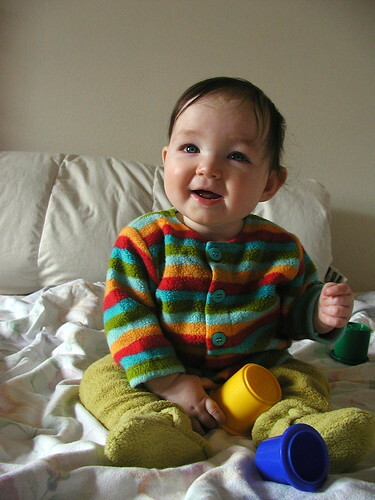 Now suddenly she's a year older, more kid than baby, with long curls all lightened by the summer sun. Our little Roo is two. 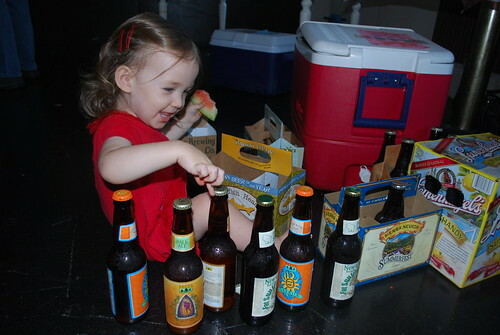 No, she's not old enough to drink yet, but she is apparently mature enough to help us inventory the beer selection. And as with everything she does, she has a grand time doing it. Happy birthday, my sweet girlie! I was at some big fancy hotel somewhere in Mexico, and there was a wedding going on in the grand, majestic lobby. The food was all out on a buffet table, looking delicious, and I wondered if it was legit for a non-guest to help herself. The desert table was filled with baked goods from the real-life French bakery in our town where we buy our bread and I thought "Our bread's getting low and La Madeleine won't be open 'til Tuesday. I wonder if they have any bread I could buy." (What does it say about me that details of my day-to-day often intrude upon even my most interesting dreams?) All this time I was walking around with Salma Hayek, who was looking quite fetching in a saffron-colored strapless dress. Salma and I made our way outside and began slow dancing to the strains of the wedding band wafting out into the street. I kept having the urge to put my head on her shoulder, but she was shorter than me and finally I figured out that I was in the dude role, dancing-wise, so I gently moved her head to rest on my shoulder. Then, suddenly, we were making out! It was full-on wet kissing with lots of tongue, and I could feel Selma's impressive breasts pressing against my more humble ones (which was, I must say, rather nice). Soon we were rolling around on the ground, really going at it. Be still my heart. I'm sort of impressed that I was able to score such a smoldering hot specimen of feminine loveliness on my very first foray into lesbian dream love. I would not have pegged myself as Salma's type. And of course, I told my Old Man about the dream this morning, grateful that the Salma-and-me scene didn't go any further than first base. One only wants to have to confess to so much after a morning of sleeping in.